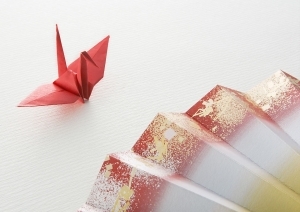 The origami (oru, to fold, and kami, paper) is the Japanese name of the art of folding the paper. The Chinese term is 折纸 zhézhǐ. In Chinese, we recognize the two Japanese kanji that is actually Chinese characters. The origami is the art of folding paper to represent reality (animals, character, flower, object, etc.) In asia, even if this art comes from China, Japanese became the master of this art. It is one of the reasons that makes we know the art of folding the paper by the Japanese noun ORIGAMI instead the Chinese noun. The origami uses in principle a squared sheet of paper that is not cut. But a certain number of creator also uses sheet of different sizes and sometimes makes carvings and collages (the staples is sometimes used). It is notably the case of M. Eiji Nakamura with these flying Origami. The origami is a succession of fold named diagram. It is often necessary to begin from a basis that is common to a group of origami. The origami can be very simple as very complicated with several folded and embedded sheets of paper the one in the other. Start by learning to recognize the symbols, the basics folds and the basis before starting directly in origami. Begin from models of simple origami, otherwise it may discourage you. For the origami, the choice of the paper is important. It must be enough thin and resistant. Some people use simple sheet of printable paper mainly to test a new model. If you use a square paper (what is often the case), verify well that It is really squared. It can seem obvious but we often just have under the hand only the A4 sheet of paper, it is then necessary to cut the paper. Sometimes a millimeter of difference can complicate the things in the implementation of the origami. In origami, it is very important to make the folds with care and precision. A millimeter of difference at the begining can generate quite a lot of problems thereafter.